USGS Fact Sheet 2015–3062: Changing Arctic Ecosystems-What Is Causing the Rapid Increase of Snow Geese in Northern Alaska? 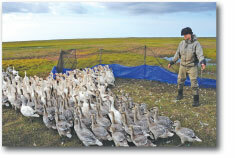 Changing Arctic Ecosystems—What Is Causing the Rapid Increase of Snow Geese in Northern Alaska? Snow Goose. Photograph by Ryan Askren, U.S. Geological Survey. Through the Changing Arctic Ecosystems (CAE) initiative, the U.S. Geological Survey (USGS) informs key resource management decisions for Arctic Alaska by providing scientific information on current and future ecosystem response to a warming climate. The Arctic Coastal Plain (ACP) of northern Alaska is a key study area within the USGS CAE initiative. This region has experienced a warming trend over the past decades, leading to decreased sea ice, permafrost thaw, and an advancement of spring phenology. The number of birds on the ACP also is changing, marked by increased populations of the four species of geese that nest in the region. 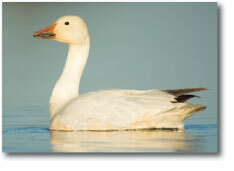 The Snow Goose (Chen caerulescens) is the most rapidly increasing of these species. USGS CAE research is quantifying these changes and their implications for management agencies. Snow Goose populations in North America have greatly increased over the past six decades, resulting in considerable damage to vegetation on nesting areas and negative effects to other bird species, especially in Arctic Canada where the increase has mainly occurred. Although once common in northern Alaska, Snow Geese were largely extirpated by humans by the early 20th century. Only a small remnant population of less than 1,000 birds nested on the ACP through the latter half of the 20th century. Surveys conducted by the U.S. Fish and Wildlife Service (USFWS) Migratory Bird Management indicate that although the Alaskan population of Snow Geese remains relatively small (about 35,000 individuals) compared to the millions of birds that nest in Arctic Canada, it is increasing rapidly. USGS captures and bands Snow Geese in late summer when they are flightless. Recoveries and recaptures of banded geese enable estimation of adult and juvenile survival, and hunter harvest. Late summer captures also provide an opportunity to measure juvenile growth; an indicator of habitat quality. Photograph by Jerry Hupp, U.S. Geological Survey. Since 2011, the USGS has studied how Snow Geese on the Colville River Delta in northern Alaska are responding to a rapidly warming Arctic and how their increase may affect other bird species. USGS examined the migration chronology of Snow Geese and 15 other species that commonly nest on the ACP and determined that Snow Geese have advanced their arrival to the Colville River Delta more than most other species over the past 30 years. Snow Geese start their nests earlier in spring and hatch young 4–7 days before other goose species, such as Black Brant (Branta bernicla nigricans) and White-fronted Geese (Anser albifrons) (fig. 1). Early hatch confers an advantage to young goslings as it gives them access to higher quality forage. This allows goslings to grow larger, which in turn benefits their autumn and winter survival, future recruitment into the breeding population, and reproductive performance as adults. USGS research determined that in most years Snow Geese on the Colville River Delta have higher nest survival and produce as much as 25 percent more goslings than neighboring Black Brant or White-fronted Geese. 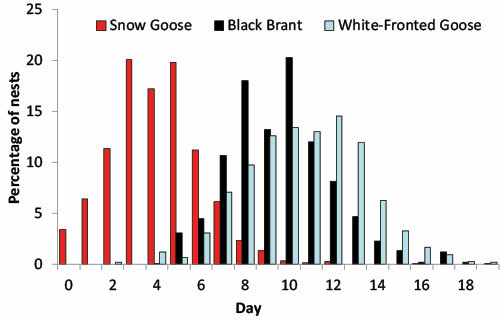 Return rates to the Arctic also were higher for female Snow Geese than for female Black Brant. Thus, high reproductive success and adult survival are likely contributing to the rapid increase of Snow Geese on the ACP. Immigration of Snow Geese from the large populations in the Canadian Arctic also may be adding birds to the Alaskan population. Based on hunter recoveries of banded birds, USGS estimates that less than 3 percent of adult Snow Geese nesting in Alaska are harvested by hunters in North America, indicating that hunting likely has little effect on the population. Figure 1. Average dates of goose egg hatching, relative to earliest nest in each year from 2011 to 2014 on the Colville River Delta, Alaska. Most Snow Geese hatch their young 4–7 days prior to the peak hatch of Black Brant and White-fronted Geese. This provides Snow Geese earlier access to brood-rearing areas. 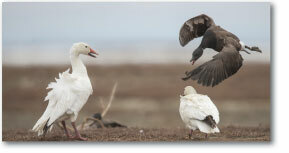 A Black Brant defends its nesting territory against Snow Geese. Photograph by Ryan Askren, U.S. Geological Survey. A key finding from earlier USGS CAE work in the terrestrial ecosystem is that warming temperatures have created advantageous conditions for successful breeding and molting by geese on the ACP. Research on the Colville River Delta indicates that brood habitat quality is good and that juvenile Snow Geese grow more quickly there than they do in other regions of the Arctic. This suggests that brood habitat is not likely to limit population growth of Snow Geese in the near future. As a result of good reproductive success, high adult survival, an abundance of quality habitat, and possibly immigration, it is likely that the number of Snow Geese will continue to increase. At the observed rate of increase, the USFWS calculates that the Snow Goose population on the ACP could double every 3–4 years. Thus, the number of Snow Geese in northern Alaska may become very large in a short period. A Snow Goose at its nest. Photograph by Ryan Askren, U.S. Geological Survey. Recent USGS research has detailed how climate-driven coastal subsidence creates high-quality foraging habitats for geese. Other research also details how the same warming causes increased coastal erosion, creating a loss of goose habitat. USGS is developing forecasts of future habitat availability that incorporate these contrasting processes. Coupled with continued demographic studies of Snow Geese, this will enable future population projections. Habitat studies will measure the effects of increasing goose populations on Arctic plant communities and identify suitable brood-rearing areas that are not yet occupied. USGS also is evaluating whether an increase in Snow Geese will adversely affect Black Brant that share nesting and brood-rearing areas. Research by the USGS CAE initiative is providing information needed by natural resource agencies to assess the ecological effects of an expanding Snow Goose population and consider management alternatives. Flint, Paul, Whalen, Mary, and Pearce, John, 2014, Changing Arctic Ecosystems—Sea ice decline, permafrost thaw, and benefits for geese: U.S. Geological Survey Fact Sheet 2014–3088, 2 p., https://dx.doi.org/10.3133/fs20143088. Hupp, J.W., and Robertson, D.G., 1998, Forage site selection by Lesser Snow Geese during autumn staging on the Arctic National Wildlife Refuge: Wildlife Monographs, v. 138, p. 1–40, accessed August 27, 2015, at http://www.jstor.org/stable/3830845. Hupp, J.W., Robertson, D.G., and Schmutz, J.A., 2000, Recovery of tall cotton-grass following real and simulated feeding by Snow Geese: Ecography, v. 23, p. 367–373, accessed August 27, 2015, at http://www.jstor.org/stable/3683108. Robertson, D.G., Brackney, A.W., Spindler, M.A., and Hupp, J.W., 1997, Distribution of autumn-staging Snow Geese on the northeast coastal plain of Alaska: Journal of Field Ornithology, v. 68, p. 124–134, accessed August 27, 2015, at http://www.jstor.org/stable/4514202. Ward, D.H., Helmericks, J., Hupp, J.W., McManus, L., Budde, M., Douglas, D.C., and Tape, K.D., in press, Multi-decadal trends in spring arrival of avian migrants to the central Arctic coast of Alaska—Effects of environmental and ecological factors: Journal of Avian Biology, https://dx.doi.org/10.1111/jav.00774. Hupp, J.W., Ward, D.H., Whalen, M.E., and Pearce, J.M., 2015, Changing Arctic ecosystems—What is causing the rapid increase of Snow Geese in northern Alaska? : U.S. Geological Survey Fact Sheet 2015-3062, 2 p., https://dx.doi.org/10.3133/fs20153062.